With its 38-square-inch grilling surface, this indoor appliance is just the right size for one- or two-serving meals, grilling most meals in 10 minutes or less. 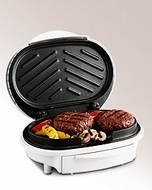 The quick-heating contact grill features an easy-to-clean nonstick cooking surface that requires minimal amounts of oil, maximizing taste through quick, thorough cooking. The grill not only sears those tasty grill marks onto food, but its grid system also keeps food above and away from grease, fat, and other excess liquids for healthier cooking. In addition, its slanted surface drains fat into the grill's removable, dishwasher-safe drip tray. By filling the drip tray first with water, it's easy to enjoy virtually smoke-free grilling. The unit's cool-touch handle provides added safety, and recipes and a handy scraper/spatula are included. Size: 11.5" x 5.25" x 9.75"